Roswell UFO Radio is the brainchild of Texas author and publisher Noe Torres, resulting from his lifelong interest in science fiction, the paranormal, unidentified flying objects, and radio drama. In the early 1990s, with the advent of the world wide web, Noe began collecting recordings of many early radio dramas, including Dimension X and X Minus One. He became a passionate fan of science fiction dramas from the golden age of radio, principally the 1940s and 1950s. Over a period of twenty years, he compiled a detailed playlist of every adult science-fiction radio drama ever aired for which a recording still exists. Originally put together for his own enjoyment, Noe decided to share his unique, hand-picked collection of sci-fi drama with the world when his Shoutcast stream first went on the air in 2007. Noe holds a Bachelor’s in English and a Master’s in Library Science from the University of Texas at Austin. With California UFO researcher Ruben Uriarte, he has written four books: Mexico’s Roswell: The Chihuahua UFO Crash, The Other Roswell: UFO Crash on the Texas-Mexico Border, Aliens in the Forest: The Cisco Grove UFO Encounter, and The Coyame Incident: UFO Crash Near Presidio, Texas. His 2011 book Fallen Angel: UFO Crash Near Laredo, Texas was unveiled at the first-annual Laredo UFO Conference. 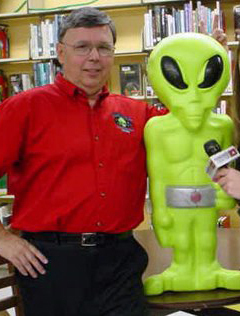 With E. J. Wilson, Noe wrote Ultimate Guide to the Roswell UFO Crash, which is the top selling guide in Roswell book stores. With Roswell historian John LeMay, Noe wrote The Real Cowboys & Aliens: UFO Encounters of the Old West. He also served as editor and publisher of the books Roswell USA by John LeMay, Roswell Alien Autopsy by Philip Mantle, and Russia’s Roswell Incident by Paul Stonehill and Philip Mantle. Noe has appeared on the History Channel’s “UFO Hunters,” Coast to Coast AM, the Jeff Rense program, and many other media outlets. He is also a frequent lecturer at UFO conferences and has appeared numerous times at the Roswell UFO Festival. He has also been a featured speaker at the Laredo UFO Conference, the Del Rio UFO Festival, the Edinburg UFO Conference, and the Border Zone UFO Festival.